Braiseworth is a forgotten little hamlet, bypassed by roads and centuries. If Eye had grown to the size of, say, Lowestoft, Braiseworth would be a name in the suburbs, nothing more. Instead, you meander along narrow lanes, mud-bespattered when I came this way in the early spring of 2003, mud-bespattered still in the summer of 2010. Theres a couple of houses, not much more. At a junction, theres the surprise of a little Victorian church, and you might think youve found what you are looking for. But you havent. The new Braiseworth St Mary was built by the maverick genius EB Lamb in the 1850s, as a replacement for the old church. Now, it is a private house, sold off in the 1970s by the Diocesan property-developers. It looks very domesticated in its hedge-surrounded garden. But you must press on, heading south, until an unsigned lane leads off to your left. It feels like a public road, but very quickly dwindles into an unmade, rutted track, and loses itself in a farmyard. A public footpath crosses here between the farm buildings, but otherwise there is no doubt that you are now on private property. So, as you prepare your words of apology and turn your car around, take a glimpse beyond the barn, beyond the farmhouse, beyond the pond. You will see something quite extraordinary, quite unexpected; a graveyard. Here for centuries, on this gentle hill, the people of Braiseworth came to be buried. And this was their church - or, part of it. All that survives is the chancel, bricked off clumsily, with a rough wooden door. The site itself is fenced off, and a sign warns Danger! Aggressive Ram in Churchyard. It is a silent, overgrown place, all the more haunting for being almost completely unknown, completely forgotten. Or, not quite. For those lost generations produced children, and some of these spread out across the world. And today, I receive e-mails from America, Australia and New Zealand, from people researching their roots. When they cannot find information about Braiseworth church, they wonder. Does it still exist? Is it still possible to visit it? The graveyard is still full of headstones, peering and tilting from the long grass, but there isnt much left of the church. On Sunday, 30 March 1851, William Chenery, the curate of Stuston, was fulfilling his duty at this little outpost. On this particular Sunday, in common with ministers of all denominations across the land, he was required by law to return a census form detailing attendance at his church. This was the only time it ever happened, and this unique occasion provides us with a snapshot into the religious practices of 150 years ago. 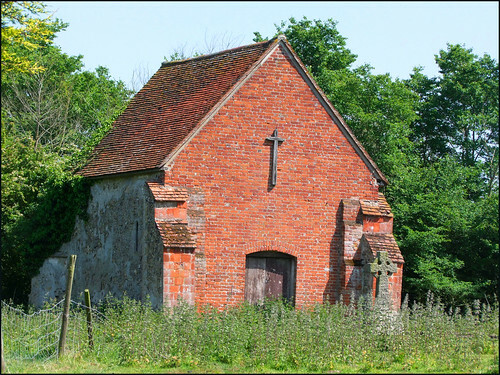 Of course, most ministers talked up their congregations on the day, but even the Reverend Chenery could only count 37 of them, making this one of the smallest congregations in Suffolk. And he had the grace to admit that it was usually no more than 20. When the Victorians set about restoring the Church of England to something like its former glory, they rebuilt many of the decaying parish churches. In Suffolk, this was almost always on the site of the former church, but a couple of places it wasnt; Melton, for example, and Westley. And here; by the 1850s, this church was a bit of a state, quite frankly, so the new building was constructed up on the main road. Bits were removed from the old church, and incorporated into the new, including the two Norman doorways to the former nave. Perhaps the remains of the old church were used as a mortuary chapel for a while (there is no graveyard at the new church) but eventually it was left to decay. By the mid-20th century, the remains were in a poor state. Visiting in the 1930s, Cautley found that only the chancel remained, with the little 1569 brass to Alexander Newton still extant on the floor. The George III coat of arms was still in situ, but the 17th century pulpit had been carted up the road to the new church. Kicking about in the ruins the same decade, Arthur Mee found the remains of the village stocks piled against the priest door. In the 1950s, Pevsner found all much the same, although he didn't mention the stocks. In the 1970s, Felgate found the brass still in place, although he said that he expected it soon to be removed to Ipswich Museum - it isn't clear to me if this ever happened. It surely cannot still be in the church, so I wonder where it is? The building's salvation came from being placed on the County Councils buildings at risk register, and it was made sound, and now stands as a memorial to the lost generations. The modern red-brick wall at the west end bears a simple cross. Few people ever see it. The remains of hundreds of lives, the almost forgotten families of Braiseworth, are tucked away in a lonely farmyard. They all had names.